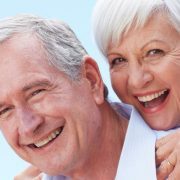 Prosthodontic dentistry deals with the science and art of restoring teeth, both functionally and esthetically. 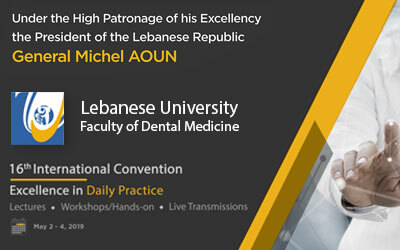 Here are some cases carried out by the prosthtodontics postgraduate students at the school of dentistry in the Jordan University of Science and Technology (JUST), under the supervision of professor Ahed Al Wahadni. 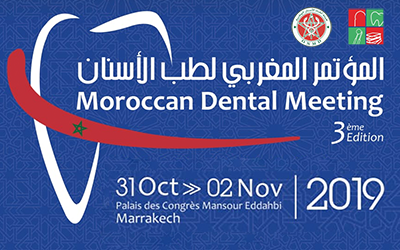 The aim of this article was to share the first experience in specialized clinical dentistry. All presented cases were the first ever cases at its kind for the designated students. Students performed the treatment and wrote the case presentation by themselves. 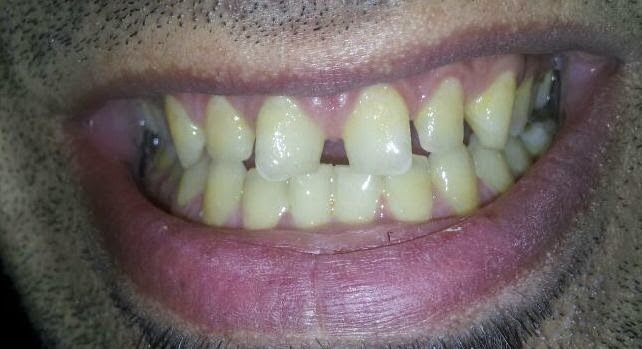 A 24 year old non-smoker male presented to the postgraduate clinics at Department of Prosthodontics at JUST, complaining of stained long anterior teeth, which he had veneered with composite one year ago. The patient has deep bite and class 1 occlusion (Fig.- 1.1). Primary alginate impression was made for a diagnostic wax up. 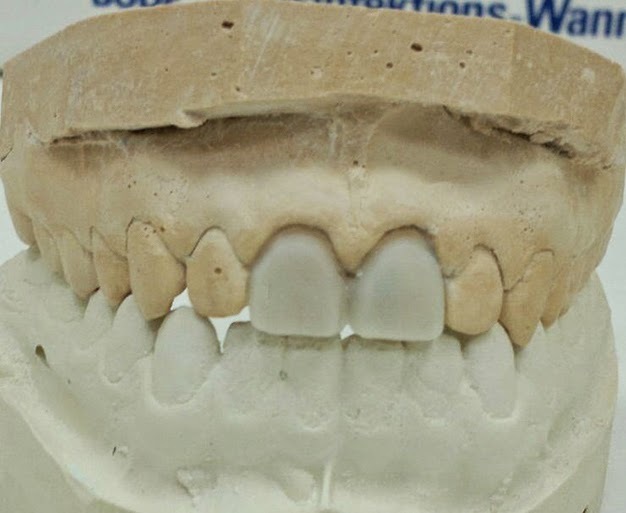 Patient was satisfied with the mock up appearance of the maxillary six anteriors, and decided to carry on with porcelain laminate veneers (PLV) procedure. Shade was selected using a Digital Vita shade device (VITA Zahnfabrik, Germany) adjunct to conventional method. A diamond chamfer bur was used to remove the existing composite revealing the underlying enamel, after that a few areas that were carious were minimally restored with composite. A supragingival finish line preparation with incisal bevel was prepared (Fig. – 1.2). Impression was made in a stock tray with additional silicon (Elite HD+, Zhermack – Germany).Laminate veneers were made in the university laboratory using IPS e.max (Ivoclar Vivadent – USA), and sand blasted with 50 microns aluminum oxide (Fig. -1.3). PLV were tried in and needed adjustments were carried out before cementing with Rely X veneer cement (Zhermack – Germany) according to the manufacturer’s instructions , final finishing was carried out a week later (Fig. – 1.4). 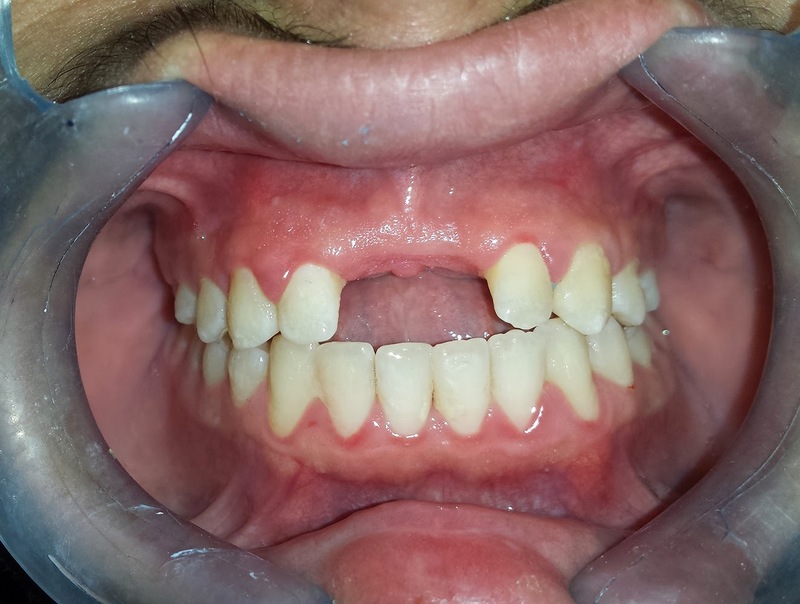 A 28 year old male presented to the postgraduate clinics at JUST, Department of Prosthodotics, with spacing between anterior teeth and rotation of the maxillary central incisors (Fig. – 2.1). 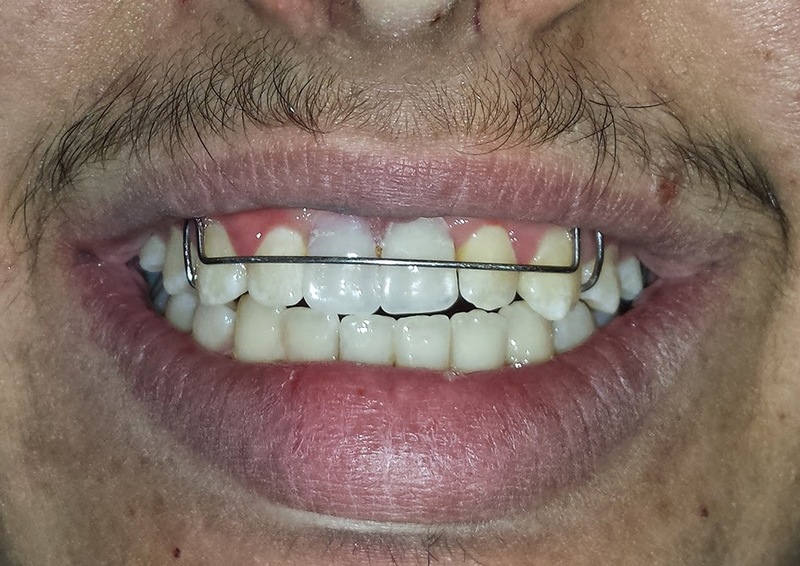 Patient was given the option of orthodontics which he refused due to time and cost limitations. An alginate impression was made and a diagnostic wax-up done and shown to the patient. An index was taken and acrylic resin temporary veneers were made for diagnostic reasons (Fig. – 2.2,3). 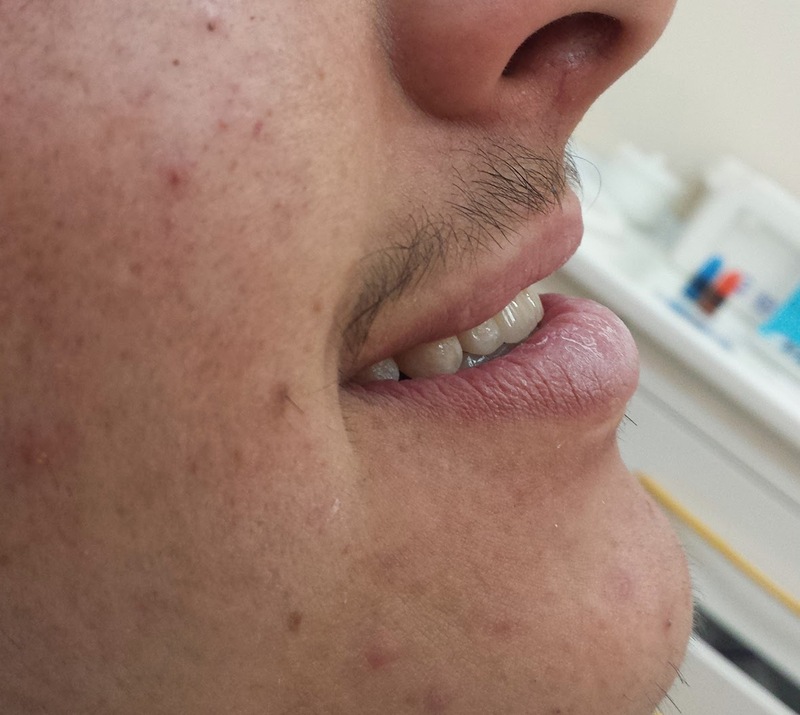 Patient was satisfied with the appearance and wanted to carry on with the PVL. An overlap veneer design was made with 0.5mm supragingival chamfer finish line. No local anesthetic agent nor retraction cords were used. Impression was made in a stock tray with additional silicon (Elite HD+,Zhermack – Germany) (Fig. – 2.4). Laminate veneers were made in the university’s laboratory using IPS e.max (Ivoclar vivadent – USA), and sand blast with aluminum oxide of 50 microns (Fig. – 2.5). Rely x veneer cement (Zhermack – Germany) was used according to the manufacturer’s instructions. Final finishing was done a week later (Fig. – 2.6). 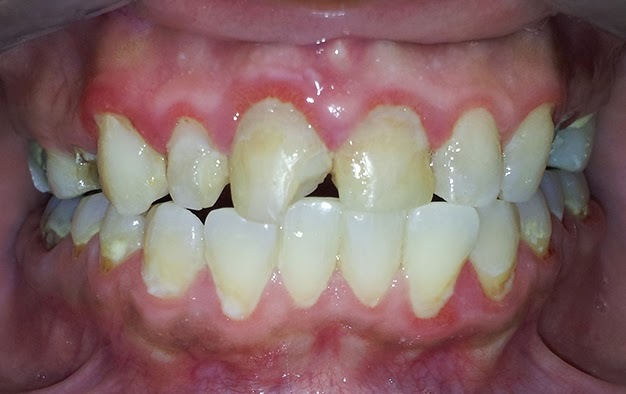 A 19 year old female patient reported to the postgraduate clinics at Department of Prosthodotics- JUST, with the chief complaint of multiple spacing between anterior teeth and yellowish discoloration (Fig. – 3.1). The patient refused orthodontic treatment due to its length. 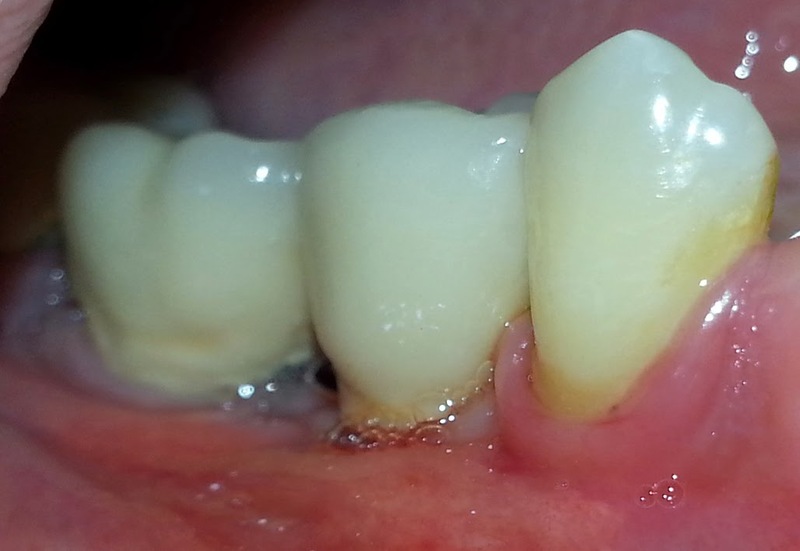 Upon intraoral examination, anterior teeth were sound and free of caries with a healthy scalloped gingiva. Maxillary and mandibular impressions were made for the purpose of a diagnostic wax-up. Scaling and polishing was carried out. A minimally invasive veneer preparation with 0.5 mm supragingival chamfer finish line was carried out (Fig. – 3.2). A final impression was made using a additional silicon impression material (Elite HD+, Zhermack – Germany). Lithium Disilicate ceramic (IPS e.max, ivoclar vivadent – USA) used to fabricate the veneers. After try-in, veneers were cemented using Rely X veneer cement (Zhermack – Germany) according to the manufacturer’s instruction. Initial finishing was carried out and completed a week later. A 30 year old female patient presented to the postgraduate clinics at JUST, for the restoration of BlueSky implant (Bredent medical, Germany) placed 4 months ago at the Department of Periodontics. 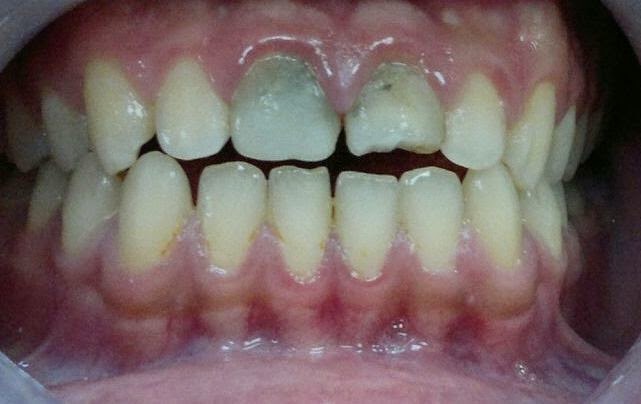 Intra-oral examination revealed good plaque control, no gingivitis and low rate of caries. 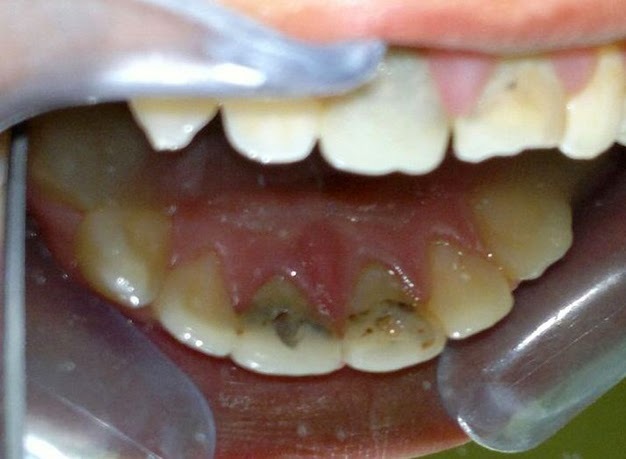 gingival formers were placed 2 weeks before presentation (Fig. – 4.1). Clinical osseointegration was confirmed radiographically and by manual examination. Close tray transfer technique was used for taking impression. 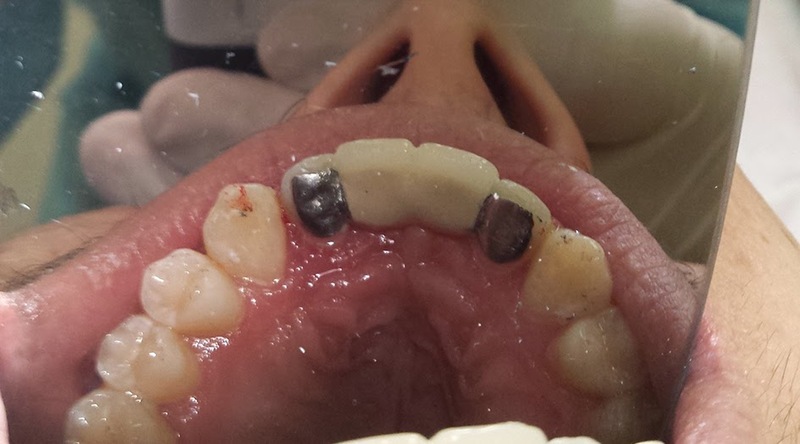 Additioanl silicon in a prefabricated metal tray was used to replicate the position of the implants. Gingival mask were placed and impression was poured using die stone. A 15R angled abutment was used for optimal position. 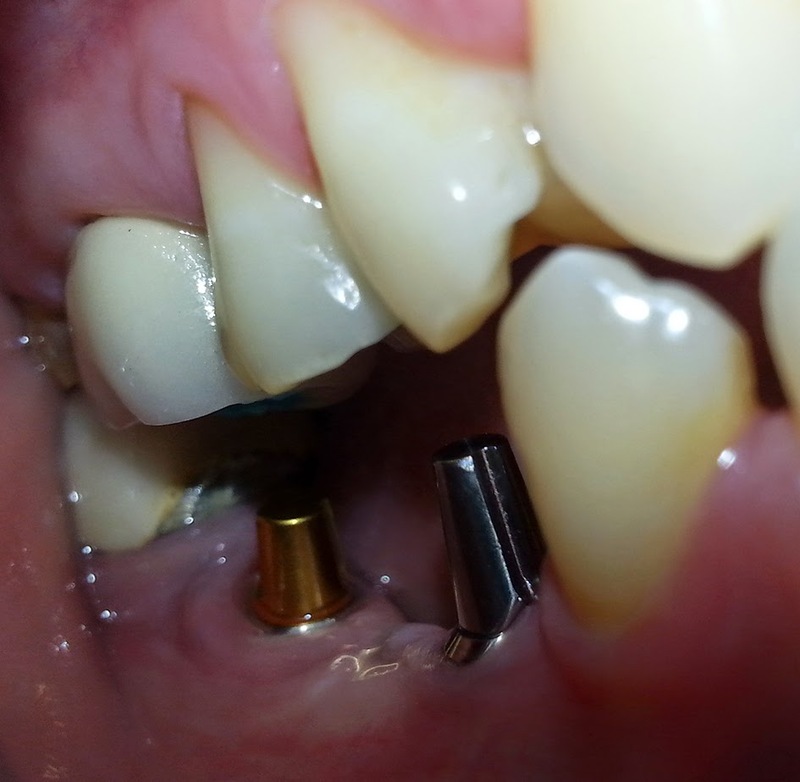 Ceramo-metal crown was fabricated, tried and adjusted to the existing occlusion. 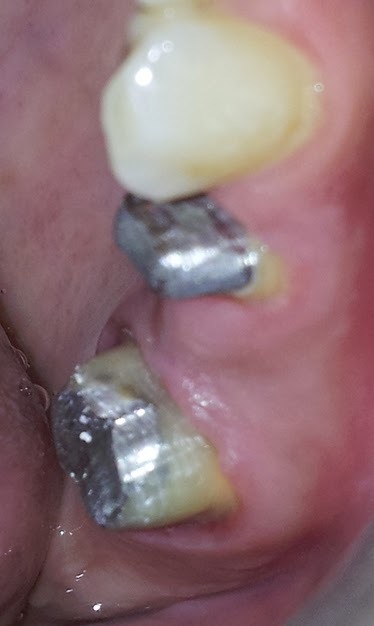 Implant abutment connection was verified and torqued (35N/cm2) and finally cemented with non-eugenol temporary dental cement (Kerr, TempBond) (Fig. – 4.2). A 35 year-old female patient with no relevant medical history presented to the postgraduate clinics at JUST, for the restoration of two implants placed in the posterior mandible five months earlier at the Department of Periodontics (Fig. – 5.1). 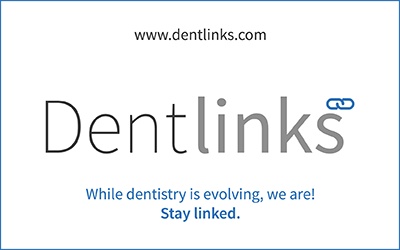 Dental history included routine dental care, extraction and multiple dental treatments. On extra oral examination, general appearance was within normal, free of any obvious illness or head and neck lesions with an almost symmetrical face. Intraoral examination revealed a healthy oral cavity, with good plaque control. A panoramic radiograph confirmed that bone support was good for all teeth. Two sandblasted large grit acid-etched (SLA) coated implants with 4.8 x 6 and 4.1 x 8 mm ( Straumamn dental Implant System) were used with a wider diameter healing abutment. 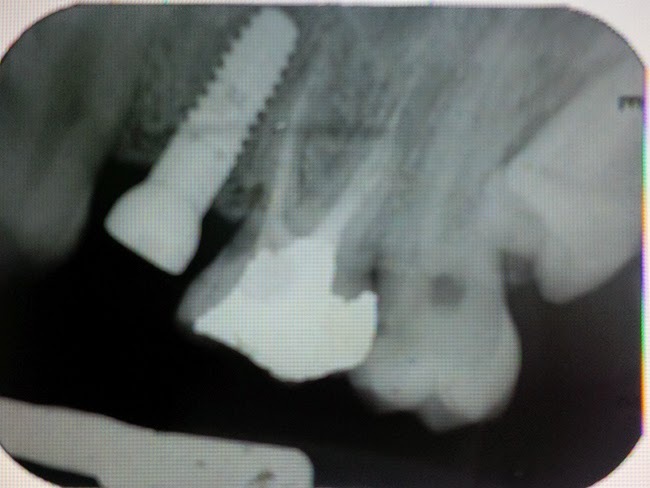 Osseointegration was confirmed radiographically and by manual examination. Alginate impressions of the maxillary and mandibular jaws were taken and a custom impression tray fabricated for use with the abutment-level impression technique. At the subsequent visit, two solid abutments were attached to the implants using abutment driver with final tightening of 35 Ncm (Fig. 5.2). 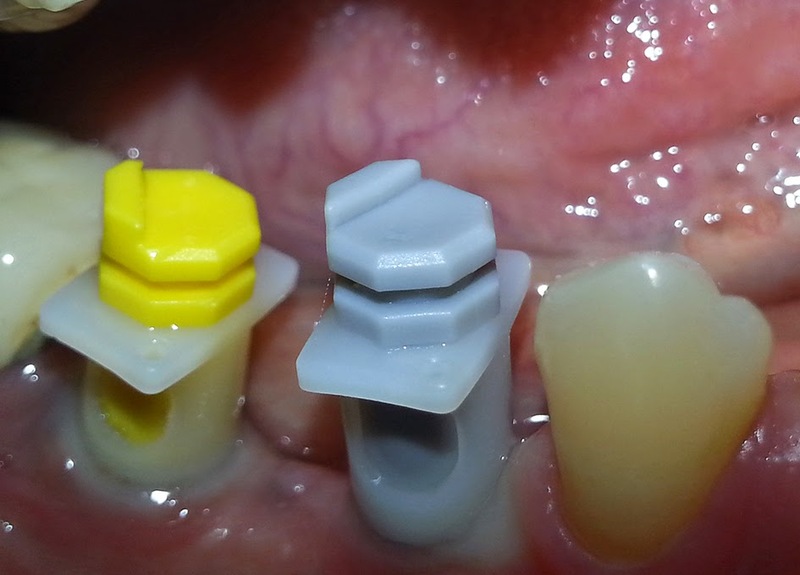 Plastic impression copings were placed over the solid abutments and a master 3333333impression was recorded in an addition cured polyvinylsiloxane material (Elite HD+,Zhermack – Germany)( Fig. – 5.3). 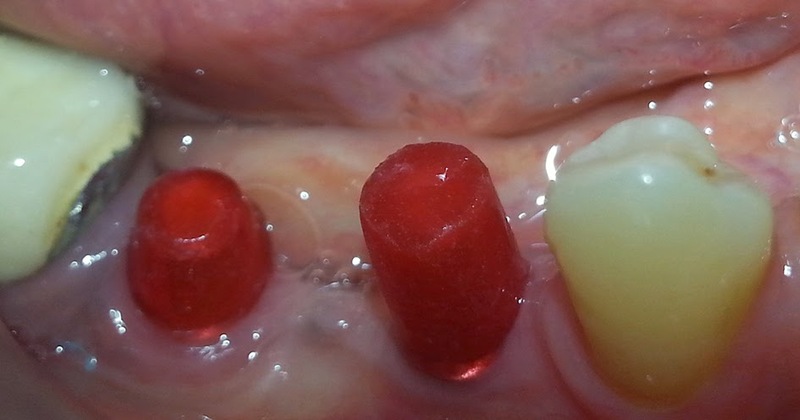 A lab fabricated protective resin pattern caps were placed using ZOE cement to prevent covering of the margin by the gingiva ( Fig. – 5.4). 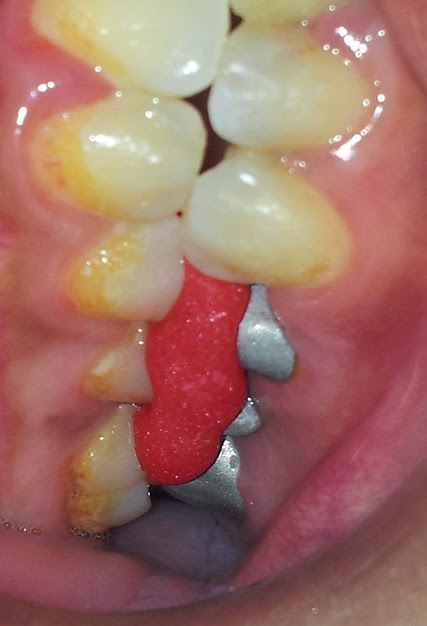 At the following visit the splinted Porcelain Fused to Metal crowns were tried and adjusted according to the existing occlusion and finally cemented with ZOE cement (Fig. – 5.5). 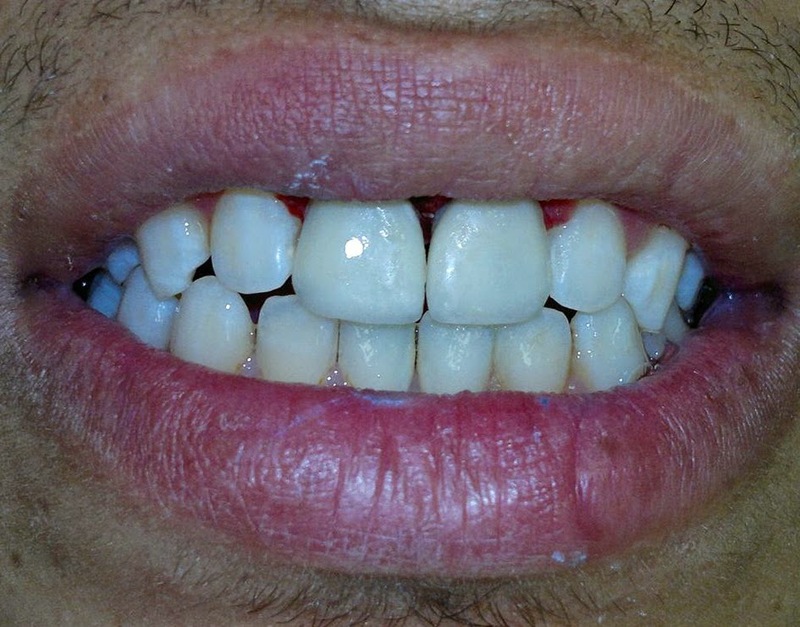 A 32-year old male patient with no relevant medical history presented to the postgraduate clinics at JUST, for restoration of a fractured maxillary lateral incisor, and complaining of multiple un satisfactory restorations on his long anterior central incisors that affect aesthetic and smile appearance (Fig. – 6.1). History of chief concern revealed that the tooth was fractured a month ago and had multiple previous restorations. There was no history of pain or discomfort around the affected tooth. The patient did not have any relevant medical problems. 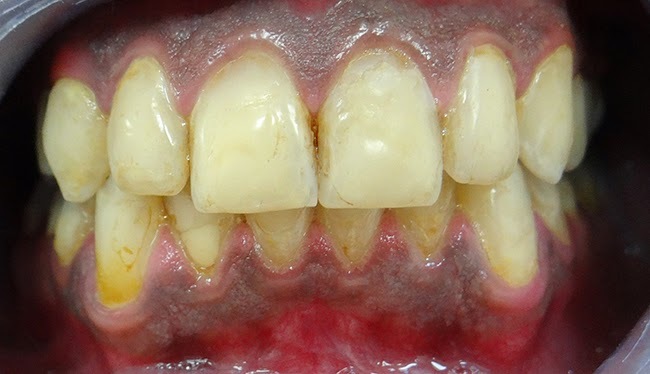 Intraoral examination revealed mild gingivitis and moderate rate of caries with heavily stained teeth due to heavy smoking. 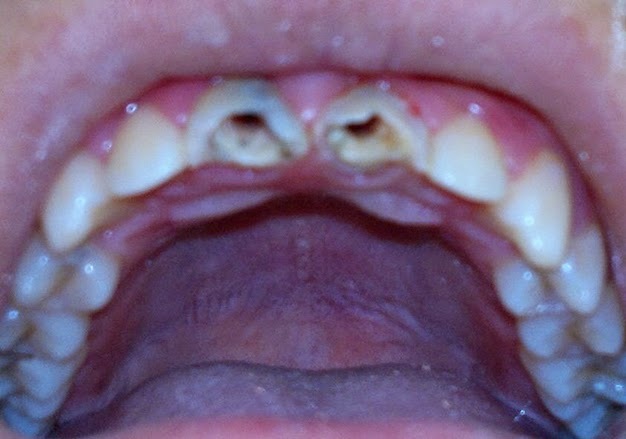 Multiple problems found in the Maxilla including: poorly designed PFM bridge replacing 4 teeth, long central incisors with multiple composite restorations, fractured maxillary right lateral incisor, missing maxillary right second premolar and carious teeth. Clinical and radiographic examinations were conducted. Intraoral periapical radiograph showed a periapical lesion on the maxillary right central incisor and the maxillary left lateral incisor. The patient presented with a class 1 occlusion with anterior guidance on protrusive movement without posterior contact, canine guided occlusion on right excursion and group function occlusion on the left. 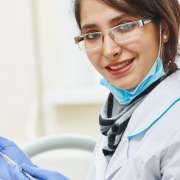 A diagnostic wax up was performed to evaluate the esthetic and functional needs of the case, and how to best address the desires of the patient. Jaw relationships, available occlusal dimensions, amount of incisal reduction needed, crown-root ratios, and potential complications were evaluated on a mounted study cast. Tooth preparation was conducted on the study model to evaluate the amount needed to achieve an esthetic result for anterior teeth. 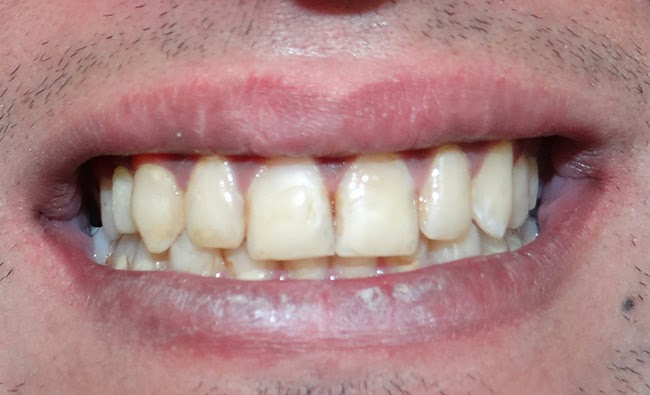 The wax up model was presented to the patient for his consideration and following a discussion of all treatment options and alternatives with him a treatment plan included: referral for treatment of teeth with periapical lesions, cast post for maxillary right lateral incisor, All ceramic crowns for central and lateral incisors with reducing their length by 2mm and Resin bonded bridge (RBB) replacing maxillary right first premolar (Fig. – 6.2). At the subsequent visit both central incisors and lateral incisor were prepared with a deep chamfer finish line to receive all ceramic crowns. Both maxillary canine and premolar were prepared with chamfers , cingulum rest for canine and mesial occlusal rest for premolar to receive RBB. A master impression was recorded using addition polyvinylsiloxane material (Elite HD+,Zhermack – Germany). At the following visit all ceramic crowns were tried in. The fitting surface was etched for 1min with hydrofluoric acid. 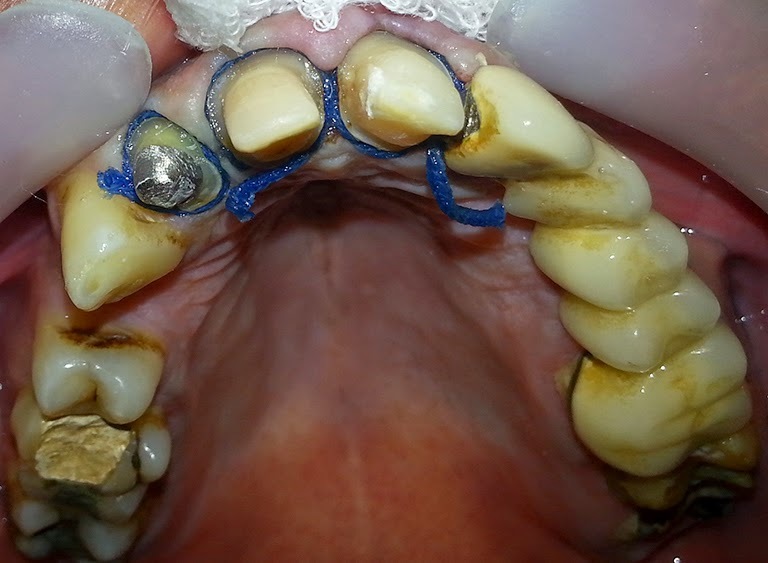 The fitting surface of the resin bonded bridge retainers were sandblasted with 50 micron aluminium oxide and all prepared teeth were etched for 30 second with 37% phosphoric acid. 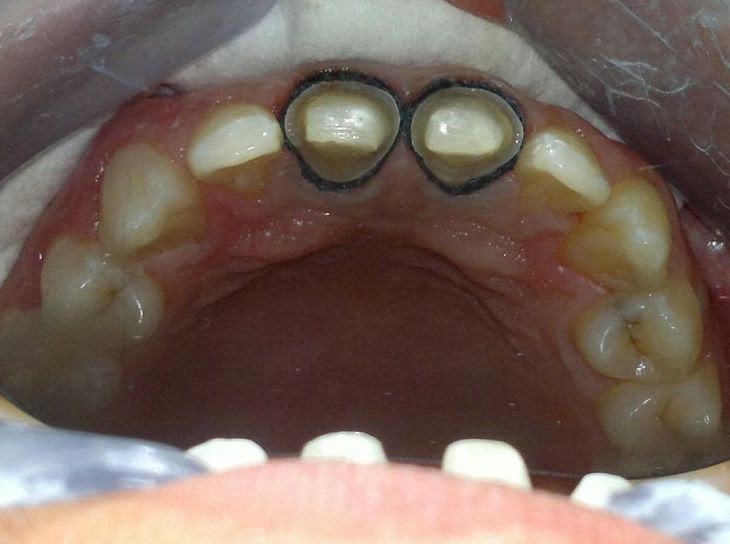 Following cementation the occlusion was checked for interferences in centric (Fig. – 6.3) and eccentric occlusion (Fig. 6.4). 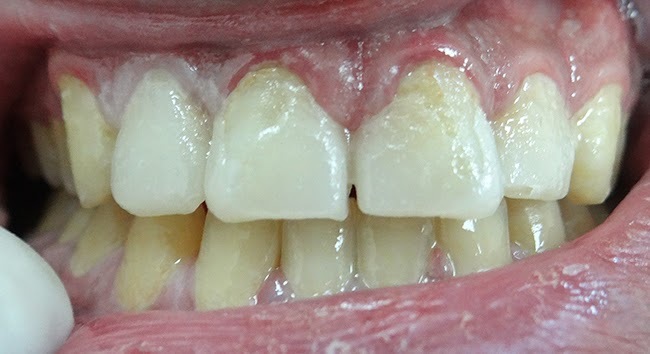 A 33 year old female presented to the postgraduate clinics at JUST, complaining of staining, a fractured maxillary central incisor, and a reduced chewing ability on posterior teeth (Fig. – 7.1). 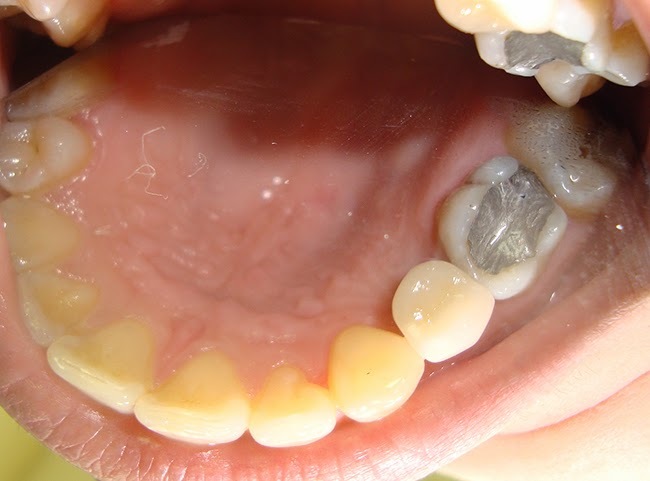 All maxillary incisors and canines were heavily restored with composite restorations, and all maxillary premolars and molars were heavily restored with amalgam restorations. The right second premolar had a minimal class II composite restoration, the left first premolar had a cast post and core, and the left second premolar and second molar were missing. 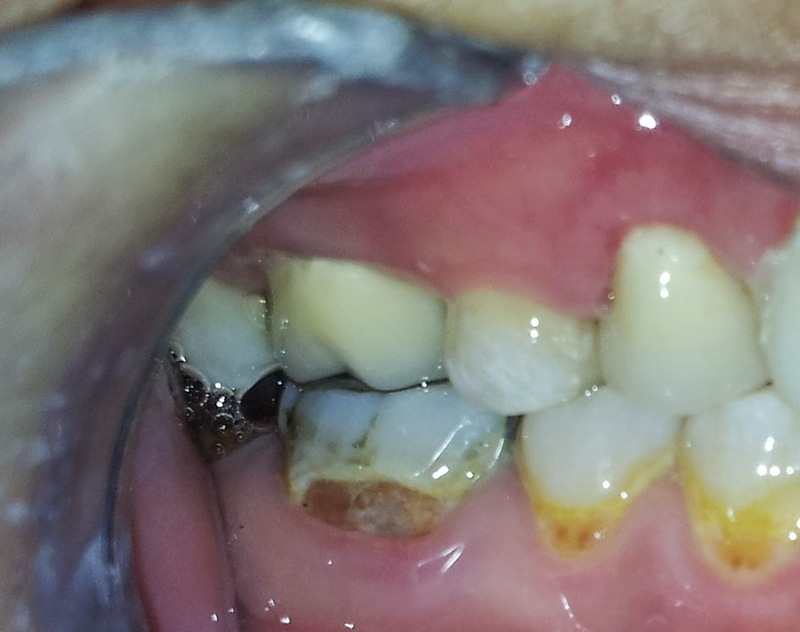 Marked generalized gingivitis was noted with recurrent caries around most of the restorations. The patient was examined and alginate (Hydrogum®, Zhermack SpA, Italy) impressions were made. 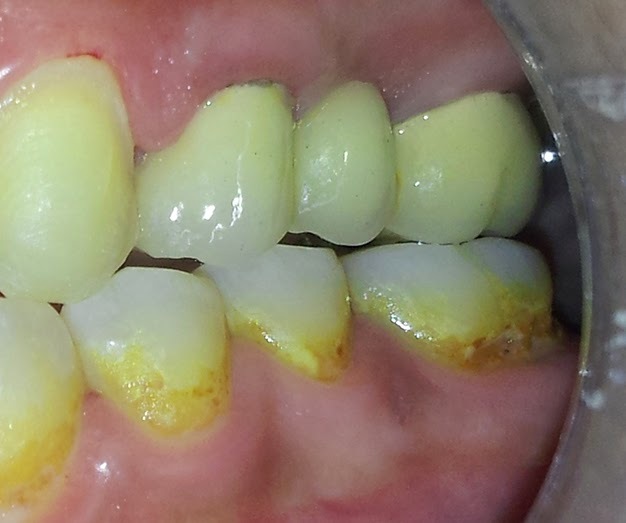 Patient was referred to the department of periodontics for scaling and polishing, dietary advice, and oral hygiene instructions. 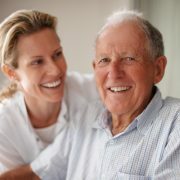 The patient was recalled and treatment options were discussed. 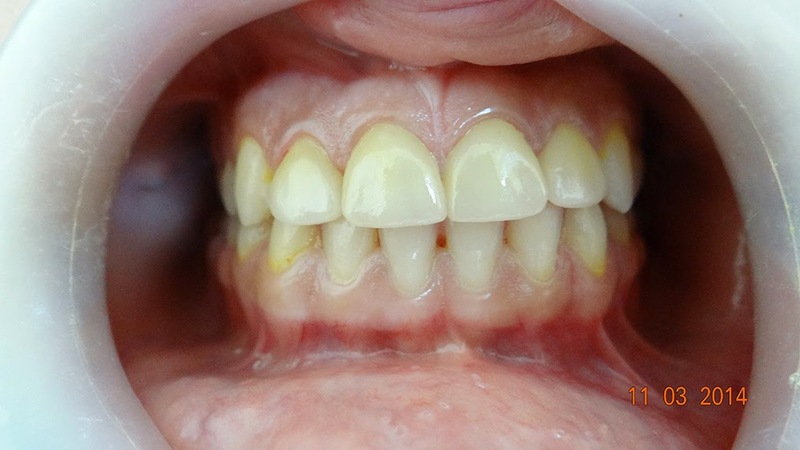 Treatment options for maxillary incisors were: all ceramic crowns or porcelain fused to metal crowns. 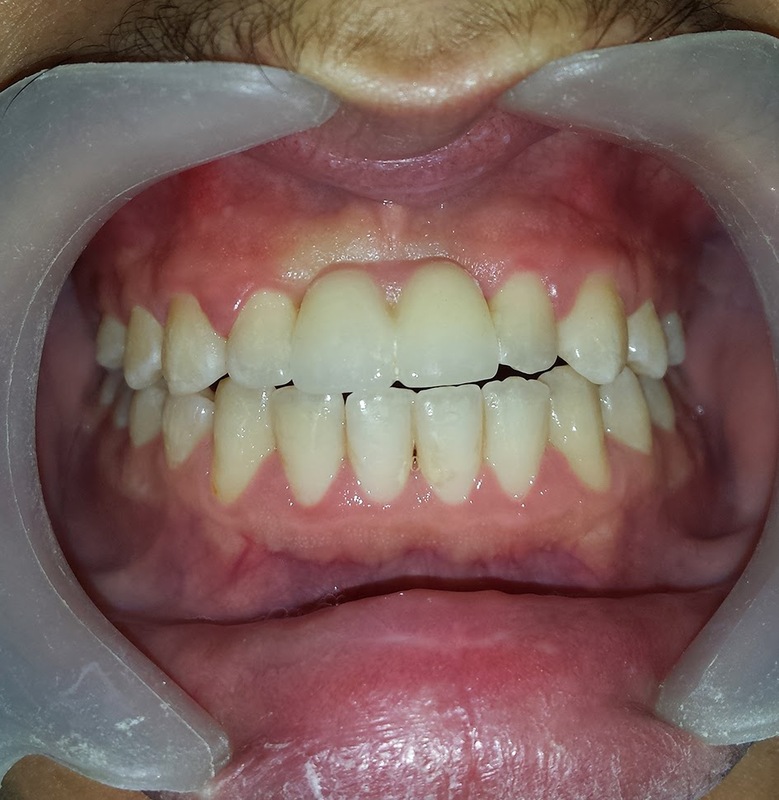 Treatment options for maxillary canines were: composite facings or porcelain laminate veneers. Treatment options for the maxillary right first premolar and the maxillary right first molar were: Cast post and core and fiber reinforced composite posts and core respectively. Accordingly, All ceramic crowns and porcelain fused to metal crowns will be used. 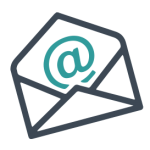 Treatment options for the missing maxillary left second premolar were: single implant retained crown, porcelain fused to metal 3 unit fixed-fixed bridge, and all ceramic 3 unit fixed-fixed bridge. Finally, the treatment of choice was: All ceramic (IPS e.max®, Ivoclar Vivadent, USA) crowns for maxillary incisors, Porcelain laminate veneers (IPS e.max®) for the maxillary canines, cast post and core for the maxillary right first premolar and the maxillary right first molar, porcelain fused to metal crowns for the maxillary right first premolar and the maxillary right first molar, and porcelain fused to metal 3 unit fixed-fixed bridge for the replacement of the maxillary left second premolar. 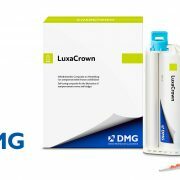 All ceramic crowns and veneers were chosen for the restoration of anterior teeth due to superior esthetic properties of the all ceramic restorations, and porcelain fused to metal crowns for the restoration of posterior teeth due to the well recognized superior physical properties of the porcelain fused to metal restorations. 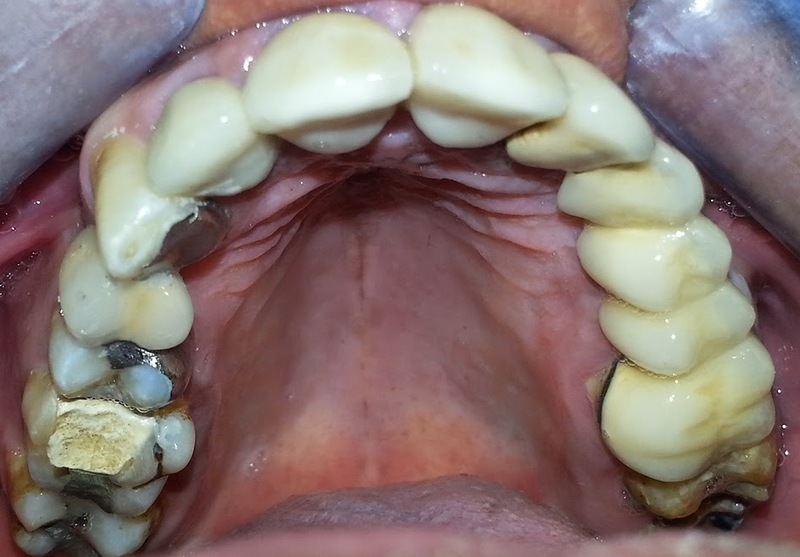 Porcelain fused to metal fixed partial denture was chosen for the replacement of the maxillary left second premolar as the poor bone quantity compromised the option of an implant retained crown. The maxillary left first premolar and molar were prepared for a porcelain fused to metal bridge (Fig. – 7.2). The final Impression was made using polyvinyl siloxane (Elite HD+®, Zhermack SpA, Italy) impression material. Metal try-in of the metal framework was performed, tooth shade was taken, and an interocclusal record was taken using acrylic resin (PATTERN RESIN™ LS, GCA, USA) (Fig. – 7.3). The final bridge was fabricated, checked intraorally, and cemented with glass ionomer cement (Ketac™ -Cem, 3M™ ESPE™, USA) (Fig. – 7.4). The palatal canal of the maxillary right first premolar and both the palatal and the distobuccal canals of the maxillary right first molar were prepared and a canal space impression was taken for both teeth simultaneously. In the laboratory, a cast post and core for the maxillary right first premolar, and a split cast post and core for the maxillary right first molar were fabricated. Cast posts were cemented using zinc phosphate cement (DeTrey® Zinc, DENTSPLY, USA). On the next appointment, the maxillary right first premolar and the maxillary right first molar were prepared and an impression was taken (Fig. – 7.5). 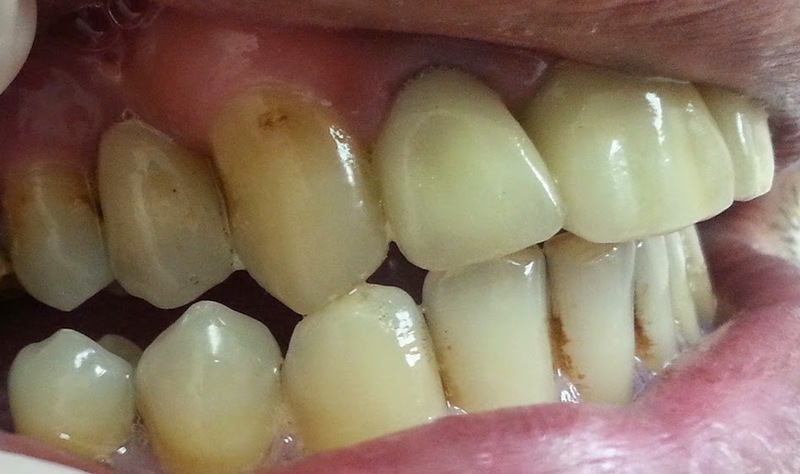 The porcelain fused to metal crowns were fabricated, checked intraoraly, and cemented with glass ionomer cement (Fig. 7.6). 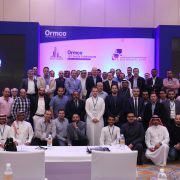 The maxillary incisors were prepared for all ceramic full coverage crowns and the canines were prepared for porcelain laminate veneers and an impression was taken (Fig. -7.7). The all ceramic crowns and veneers were fabricated, checked intra orally, and then cemented with resin cement (Variolink® II, Ivoclar Vivadent, USA) according to manufacturer instructions. The patient was pleased, and had a marked improvement in function and esthetics (Fig. – 7.8). 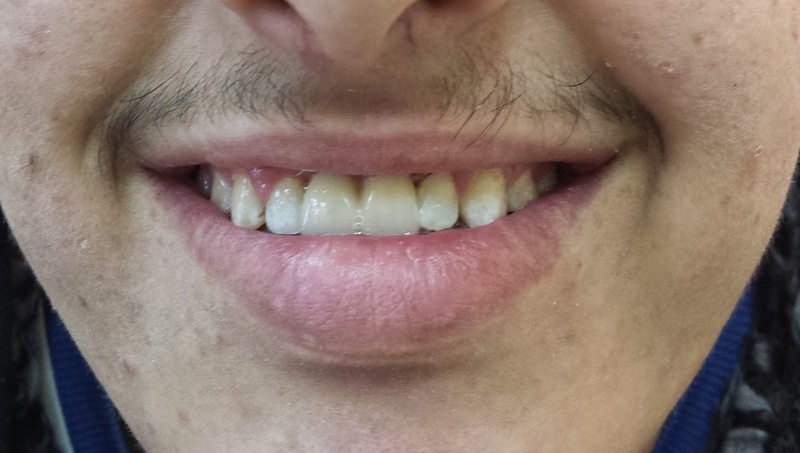 A 19 year old male referred from Department of Orthodontics to the postgraduate clinics at JUST, with an aesthetic problems due to missing both central incisors (Fig. – 8.1). Incisors were lost due to trauma long time ago and orthodontic treatment has been done to align teeth. 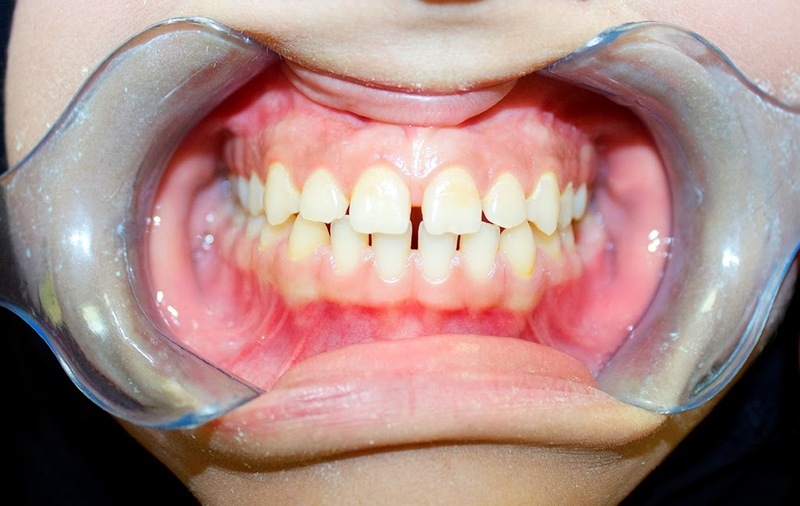 After orthodontic treatment, the orthodontist placed a removable retainer with two acrylic teeth attached for aesthetic reasons as a temporary solution (Fig. – 8.2). 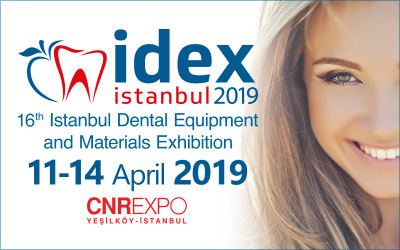 Following examination a diagnostic wax-up was done, and he following treatment options were suggested: implants, conventional fixed-fixed bridge, or a Resin-Bonded bridge. 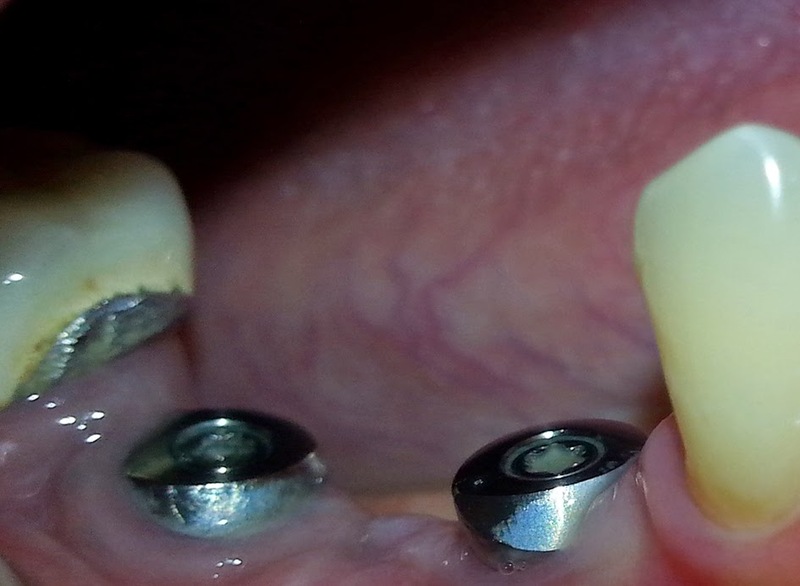 Due to financial limitations, A resin–bonded bridge was chosen over Implants. Minimal preparation was carried out on both maxillary lateral incisors with palatal supragingival 0.5 mm finish line and a cingulum rest seat, incisally the finishline was 2 mm below incisal edge. 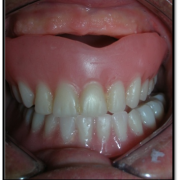 At the next appointment, resin bonded fixed partial denture was seated. Marginal adaptation and occlusion were checked then sent to the laboratory to add pink porcelain cervically. Panavia F luting cement (Karrary Co. Ltd, Osaka, Japan) was used for cementation. Cementation procedure was carried out according to the manufacturer’s instructions. 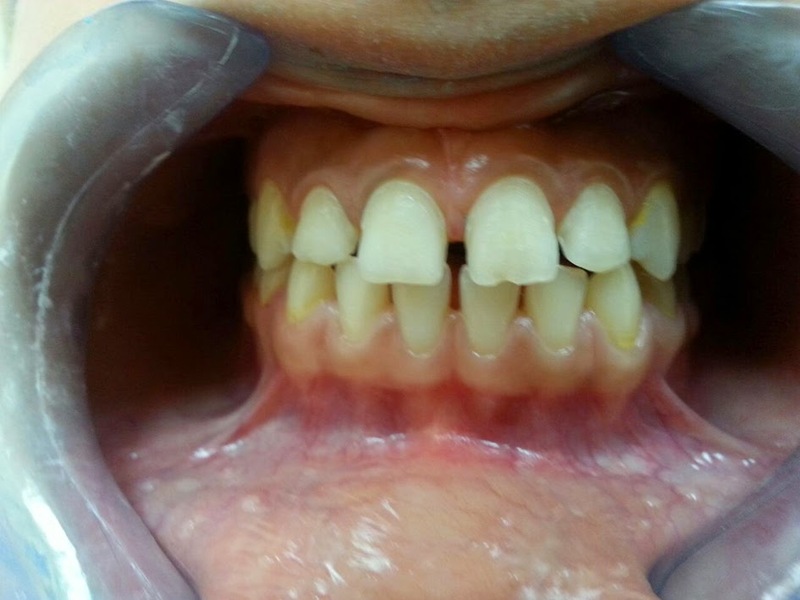 A 19 year old male patient in a good general health, presented to the postgraduate clinics at JUST, Department of Prosthodotics, with extensive discolored composite restorations on his maxillary central incisors teeth (Fig. – 9.1,2). 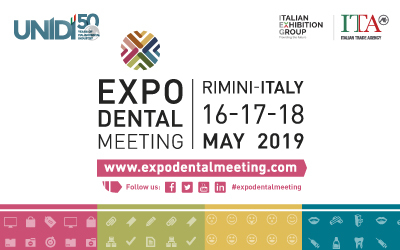 Clinical examination revealed sound dentition with some incipient caries and moderate generalized gingivitis compatible with plaque accumulation and fair oral hygiene. Radiographic examination of the central incisors showed endodontically treated teeth without any periapical lesions. The teeth have been fractured due to trauma few years ago. Two treatment options were given to the patient: cast post and cores and PFM crown, or fiber posts, composite core, and all ceramic crowns. 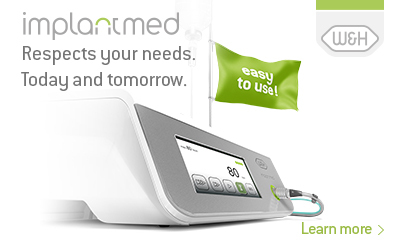 The patient preferred the all ceramic option due to superior aesthetics. The teeth were then prepared for fiber posts (Reforpost, Angelus, Brazil ) (Fig. – 9.4), which were cemented using Panavia F luting cement (Karrary Co. Ltd, Osaka, Japan). After that cores of composite resin cement were built up, the teeth were prepared for all ceramic crowns (Fig. – 9.5). Impression was taken using PVS impression material. Crowns were made at the university labs. 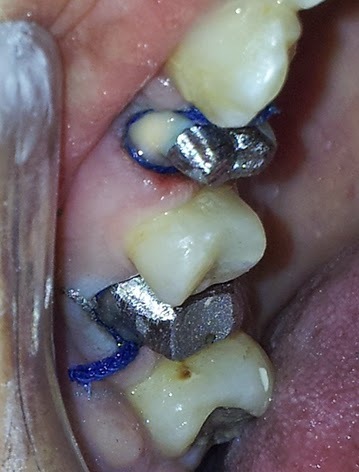 After try-in, crowns were cemented using Rely X cement (Zhermack – Germany). (Fig. 9.6). This diversity of cases indicate that the students will have been exposed to a wide range of cases before they have graduated. 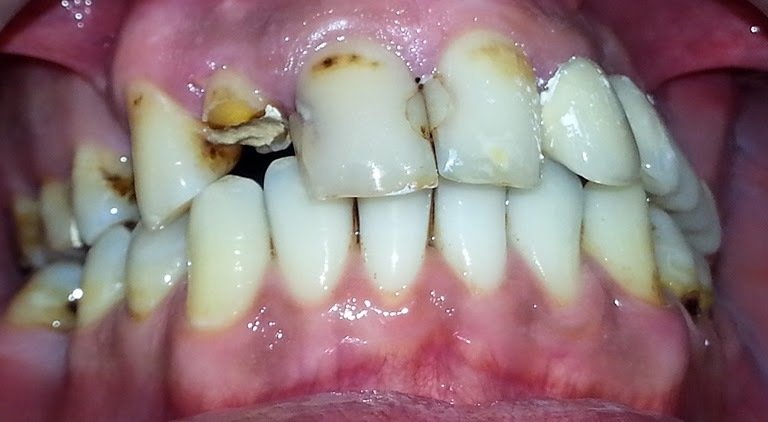 Though the patients were completely satisfied, there were some unsatisfactory parts of the treatment but does not affect the oral nor dental health of the patients. These limitations were due to the lack of experience of the students. Students were in their first experience in this type of treatment modality. 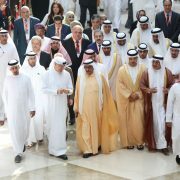 By MDSc students A. Abu-Laban, A. Al-Daqaq, L. Alwes, A. Shahin, M. Barakat, R. Al-Khatatbeh, I. Obeidat, and Pr. Ahed Al-Wahadni. 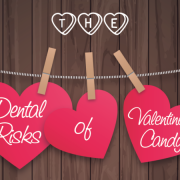 5 Valentine’s Day Dental Tips – Love your teeth too!